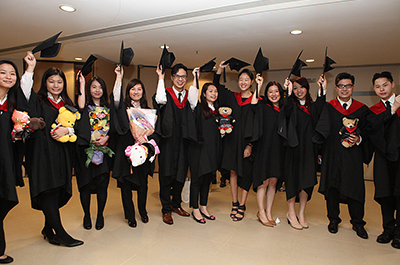 More than 800 students celebrated joining the extended Edinburgh Napier family at five different graduation ceremonies in Hong Kong and Macau last month. 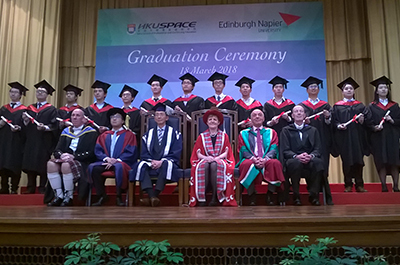 University Principal & Vice Chancellor Professor Andrea Nolan visited institutions in Hong Kong and Macau with Edinburgh Napier staff to congratulate the new alumni as they enjoyed their graduations with family, friends and fellow students. 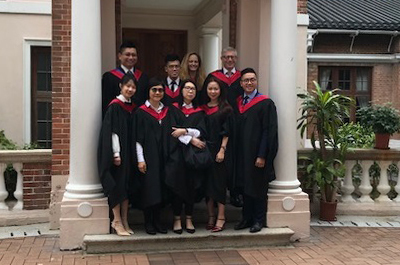 On Sunday 18 March, more than 300 undergraduate and postgraduate students were awarded their degrees in two ceremonies at Loke Yew Hall at the University of Hong Kong, where Edinburgh Napier collaborates with the School of Professional and Continuing Education, University of Hong Kong (HKU SPACE). Students graduated from the Business School, the School of Arts & Creative Industries, the School of Applied Sciences and the School of Engineering & the Built Environment. 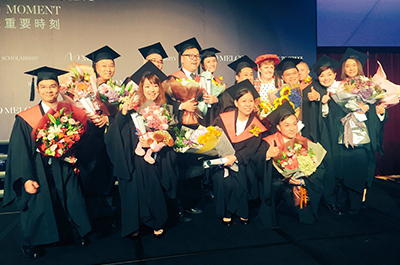 The following Wednesday, a further two graduation ceremonies were held at Kowloonbay International Trade & Exhibition Centre, also in Hong Kong. 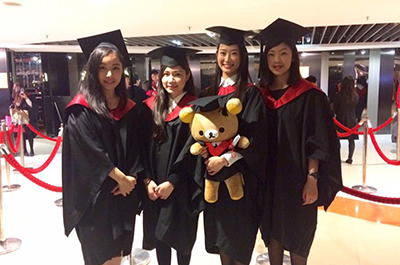 Nearly 500 undergraduate students from the Business School were awarded their degrees from Edinburgh Napier in collaboration with the School of Continuing and Professional Education, City University of Hong Kong (SCOPE). 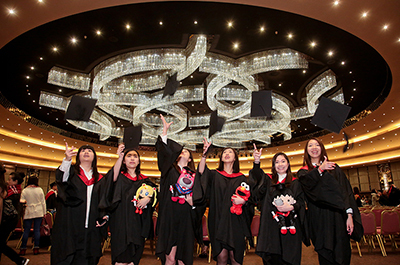 There was also a ceremony in Macau on Monday 19 March, where students graduated with a Bachelor of Arts in International Business Practice delivered in partnership with Melco Resorts and Entertainment Ltd. Edinburgh Napier joined forces with the gaming and entertainment company to develop Macau’s first in-house Bachelor’s degree. Edinburgh Napier works with a number of partners around the world to provide a range of international activities including joint teaching, student and staff exchange programmes, research and knowledge exchange. The University has delivered courses in Hong Kong since 1992, with around 12,000 students graduating from the region since partnerships began. Through its partnerships with SCOPE and HKU SPACE, it currently has more than 2,000 students studying in Hong Kong across a range of courses including Accounting, Marketing Management, Financial Services and Social Sciences. Edinburgh Napier’s School of Arts & Creative Industries also has a festival internship programme with the Hong Kong Academy for Performing Arts.